Anywhoo, I was able to salvage half a dozen squashes. When I think of butternut squash, I think of fall….nice gratins, creamy soups, delicious pies and muffins. 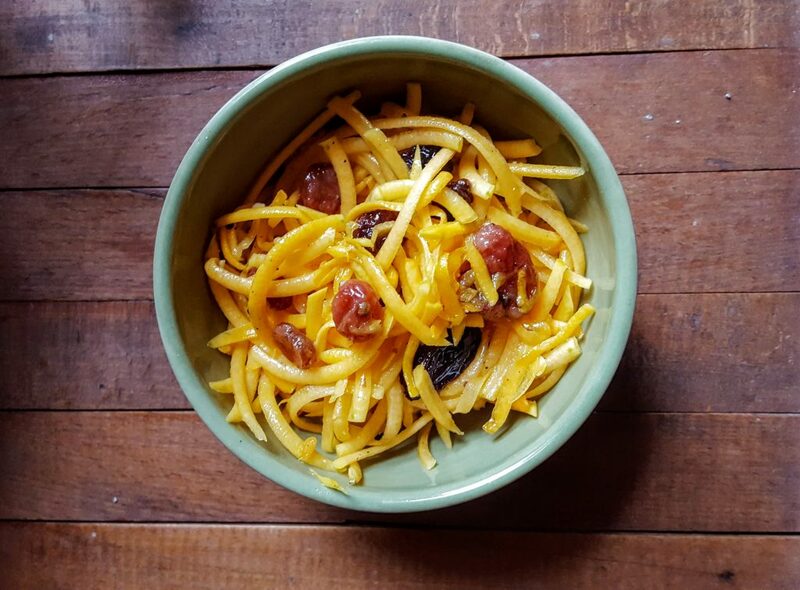 I wondered if you could eat it raw and after a couple of searches I came across some delicious sounding recipes: Raw Butternut Squash Salad with Ginger and Raisins by Mark Bittman and Fresh Butternut Squash Salad with prosciutto, Parmesan and walnuts by Marc Meyer. Although I have to admit that the latter one sounded more delicious, I had everything to make the former one. So, Raw Butternut Squash Salad with Ginger it was. You will not believe how delicious this is. The raw butternut tastes like a cross between a watermelon and a carrot (if that makes sense). Peel and seed the squashes. Shred in a food processor. Place in a large serving bowl. In a smaller bowl, combine oil, vinegar and ginger in a salad bowl; add salt and pepper to taste. 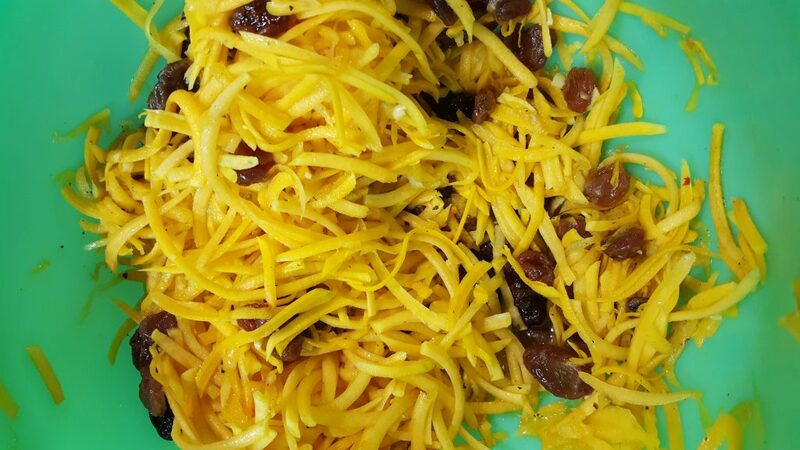 Add raisins to the serving bowl with the shredded squash. Toss with the vinaigrette. Taste and re-season if necessary. Serve immediately, or cover and refrigerate for up to several hours. This is basically Bittman’s recipe except I doubled it because I was feeding a crowd. I also used the jumbo raisins because they are my favorite. The results? It was a huge hit. Everyone who came through our buffet line (we served this with some grilled flank steak and another huge hit of a salad to be posted soon) thought it was a giant bowl of grated cheddar cheese. This salad is perfect for summer—no cook and so simple. Hope you try it. I’m linking up with Deb’s (at Kahakai Kitchen) Souper Sunday! I never thought about butternuts in salad either. I like roasting them quite a bit. Pity about your plants. I am a horrific gardener, I haven’t had lots of luck lately. Thanks for this great recipe! Great, I need to find the squash fast! Unexpected, isn’t it? I’ve never thought you could eat raw squash, but I can see how it’s possible. Carrot + watermelon? OK.
What a fabulously creative dish!!! Love it! Sorry your squash plant bit the dust. Don’t you just hate it when that happens? Things like that happen all to frequently in our garden, alas. Anyway, I don’t remember ever having raw butternut squash. Really neat idea, and this sounds like a delish dish. Thanks! Save your squash next year using tea tree oil. Squash bugs hate it. I use it before the squash bugs come. l cup water to 1 t. tea tree oil. Spray around the base of the squash several times through the season. Mine made it through the whole season last year. For more information google tea tree oil in the garden. Bummer about your squash plants! 🙁 This salad looks so good and perfect for hot days and no cooking. Thanks for sharing it with Souper Sundays this week.